In ultrathin sections of polytene chromosomes, large thick bands can usually be seen easily. Visualization of thin faint bands depends mainly on two factors: (1) the method of fixation and treatment prior to embedding and (2) the thickness of the sections analyzed. Fig. 1. The 9A-10B region of the X chromosome. The chromosome was fixed in 3 : 1 ethanol/acetic acid. Scale bar: 1 |im. Fig. 2. Banding pattern of polytene chromosome regions in serial sections of different thickness: (a) 50-70 nm and (b) 120-150 nm. Scale bar: 1 |im. way to detect thin bands, like those in Fig. 1, is through analysis of serial sections of many chromosomes. Accuracy of polytene chromosome mapping as well as interpretation of the observed images depends both on the DNA content and the degree of DNA decompaction in a given structure. Therefore, section thickness plays an important role in the analysis of banding pattern (10). 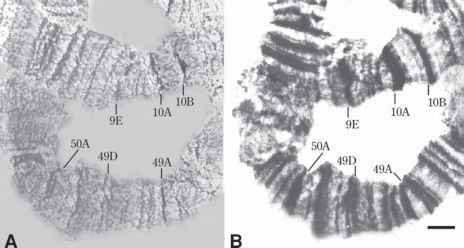 Figure 2 shows thin (50-70 nm) and thick (120-150 nm) sections in two regions, namely 9-10 and 48-49 of the D. melanogaster X and 2R chromosomes, respectively, made from the same Araldite block. In the 50- to 70-nm ultrathin section (see Fig. 2A) it is difficult to identify very thin bands and to interpret the structure of large bands. In the thick section, two bands positioned close to each other may look like a single band (see Fig. 2B). Although neither image furnishes a detailed picture of the banding pattern, the comparison nevertheless demonstrates a clear advantage of the thick section over the thin one. In the thin section, many of the large bands exhibit a reticular, fine flaky structure. Faint bands are tightly juxtaposed to large ones and it is quite impossible to determine the exact number of bands, as they look like an indivisible network of chromatin. In the 120- to 150-nm sections, faint bands cover a larger cross section, which facilitates their detection (compare the 9E-10A region in Figs. 1 and 2). The same conclusion was made earlier by Berendes (8), who proposed to use even thicker sections (150-200 nm). However, large neighboring bands in such sections often look fused. Finally, the detectability of bands depends on the extent of stretching of the polytene chromosome. Therefore, the quality of chromosome structure should be monitored using the light microscope before sectioning is done with an ultratome. 1. The banding pattern of a region has to be reproducible in serial sections of at least two or three chromosomes. 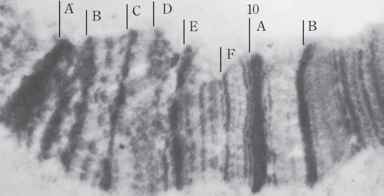 Single dense structures of very small size (approx 1/20 of chromosome diameter) with approximately equal length and width are not regarded as bands. 2. The best fixative is a 3 : 1 alcohol : acid mixture. Vacuole like formation in large bands increases with increasing fixative hydration, which gives rise to doublet artifacts. 3. In estimating the number of bands taking part in puff development, the beginning and end stages of the process should be included in the analysis and the chromosomes of larvae at different developmental stages should be studied. 4. The optimum thickness of sections used for mapping is 120-150 nm.